Here's the problem. 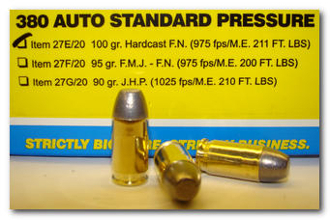 The current 380 auto frangible ammo delivers a large amount of surface trauma, but lacks serious penetration. For example, if you shot me or another sane man in the face with modern frangible 380 ammo, it would blow off a big portion of my cheek and send a few teeth down my throat, I would undoubtedly fall to the ground in shock and pain, but I would be very much alive and functional if I could get past the shock and pain as that frangible bullet would have stopped some where inside my face, never making it to my brain. However, if you shot a drugged up maniac in the face with that same frangible 380 ammo and blew half his cheek off, he would keep right on coming because he is insane and is not thinking like you or I. Plus, he is likely pain free and fear free and wont know that half his cheek is missing and if he did know, he would not care. So whatever 380 ammo you shoot him in the face with, had better go through his face and blow his brain stem out the back of his head, because only a CNS (central nervous system) hit with a 380 is going to stop him. Likewise, a torso hit to the sternum needs to penetrate deep enough to blow all the way through his spine in order to shut him down spontaneously. If you fail to shut him down instantly, you and your loved ones are going to have to find a way to survive while you wait for him to bleed out and pass out. The best chance of survival for you and your family is to shut down the attacker instantly. So, we've designed a few 380 auto standard pressure loads to keep you and your loved ones alive under the worst of scenarios. Item 27E/20 is a 100gr. HARD cast bullet with a flat nose. It is traveling over 1,000 fps out of my 3.75 inch BDA (Browning Double Action). We've used a flash suppressed powder for all three of our 380 auto loads so that you wont be blinded by your own gunfire if you have to shoot in the dark and since around 95% of all civilian shootings in America occur in low light, the chances that your own gunfire will blind you while you are trying to save your life, are good - we've eliminated this variable by using flash suppressed powder. We've also chosen a flat nosed solid bullet. The flat on the nose ensures that the bullet will cut/smash its way through flesh and bone and do much more destruction than typical round nose FMJ bullets. Round nosed bullets tend to slip and slide through matter, doing little damage as opposed to a flat nosed bullet. The flat nose not only wounds much more than a round nosed bullet, but it actually keeps the penetration straight and thus deeper. Notice the below velocities recorded from my personal 380 auto pistols. These are real world guns and thus the speeds are realistic and not exaggerated speeds produced from laboratory test barrels. What you see with Buffalo Bore Ammo, is truly what you get in the "real world", where it matters. You can expect 20+ inches of straight-line penetration in flesh and bone with this load. If you are worried about over penetration with this load, DON'T! You chose to carry a tiny under-powered 380 auto pistol and the trade-off is that you are now going to have to stay alive with that pistol and over penetration will be the least of your worries if you end up needing this gun to save yourself or your family.